Healthy Feeling Skin, Happy Baby. Between messy mealtimes and curious crawling, it's not easy keeping active babies clean. Our Gentle All Over wipes are designed to gently yet effectively clean tiny faces, feet, and everything in between. Enriched with silk extract, our wipes glide away 3X more mess*, leaving skin silky smooth and feeling healthy. JOHNSON'S® Gentle All Over Wipes can be used all over babies’ skin, including bottoms, hands and delicate faces. Simply open the pack, remove a wipe and clean your baby's skin. Close lid after use. 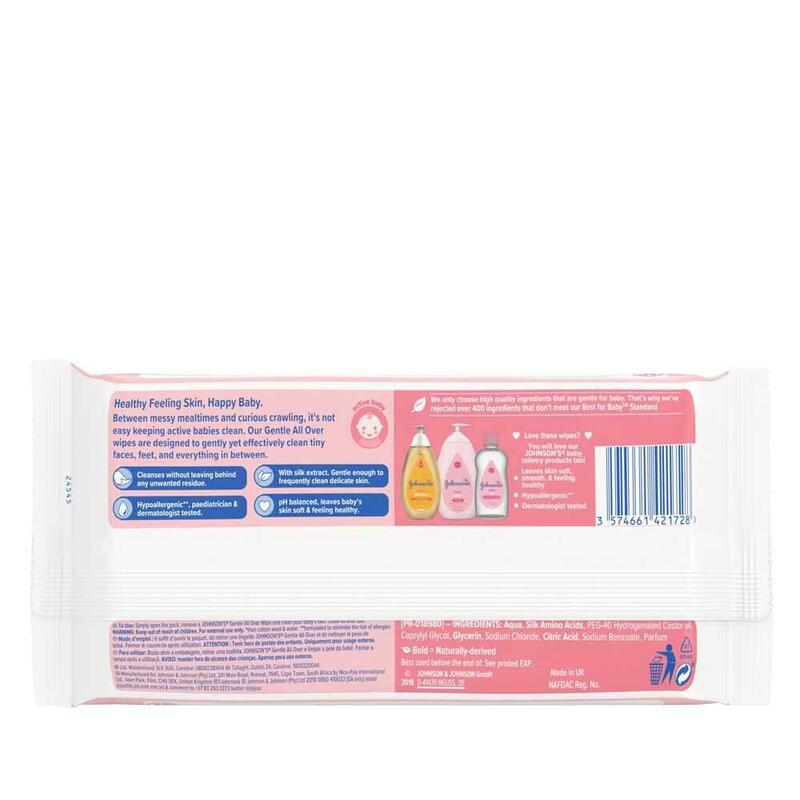 Have always used these wipes and never had a problem until you changed them now I can not use them on my daughter, she got one and wiped her face and her whole face went bright red straight away and stayed that way for hours. They smell potent of perfume also my skin felt itchy after . I’ve used the original for years and I’m very unimpressed that the only Thing I could trust not to flare up my skin has now completely changed . 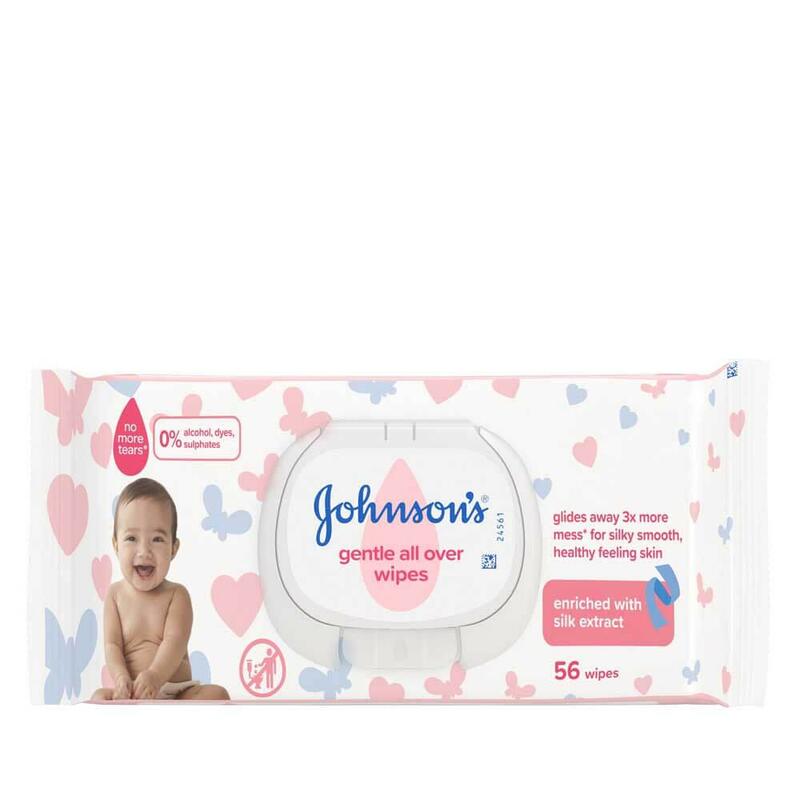 i have used the johnson and johnsons all over gentle baby wipes for many many years now and they are a joy to someone whos allergic to a heck of a lot of stuff like i am. lately i cannot find them so my husband brought home the new ones with silk for my to try. upon opening there is a strong perfume odour and whn i took one out it felt so so soapy. this is nothing like the old ones :( it is a sad state of affairs when something i have loved and loved to use for years is changed. i hope you will be changing them back. Since using these baby wipes my 18 month old has come out in terrible nappy rash. I’ve had to stop using them. They also smell horribly strong, not a pleasant odour at all. Can i ask why the pink package Johnsons baby wipes have been changed? They were very good before. The reply on this page simply says people receive a response by email but it would be useful to have a public reply before people waste their money, given that everyone is complaining! I bought a bulk pack thinking only the packaging was different but they smell awful, the product is obviously completely different and I am concerned about using them now after other people have reported a reaction on their baby's skin. Have been using these wipes on my little one since birth and loved them, then the packaging changed and suddenly every time I wipe his face he now turns red and blotchy! Such a shame but I will avoid these entirely in future. Having used your wipes for years with no problems these new wipes are terrible. They are much drier and all the ingredients listed are completely different to the original wipes. My daughter’s face came up in an instant red rash when I wiped her. This never happened with your other wipes. I will never buy these again. Why did you change them?